Are you looking for a custom made U channel for your project and the standardized U-Channels available in retails stores just not meet your specifications? You are very close to configuring your U channel based on your requirements with MetalsCut4U! 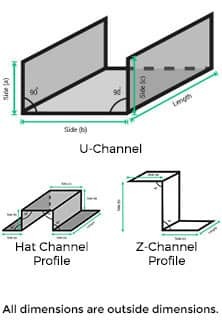 How to configure your custom fabricated metal u channel online? you already have fulfilled 3 out of the 4 easy steps to configure your sheet metal u channel. In the 4 step you choose the u channel to be configured. 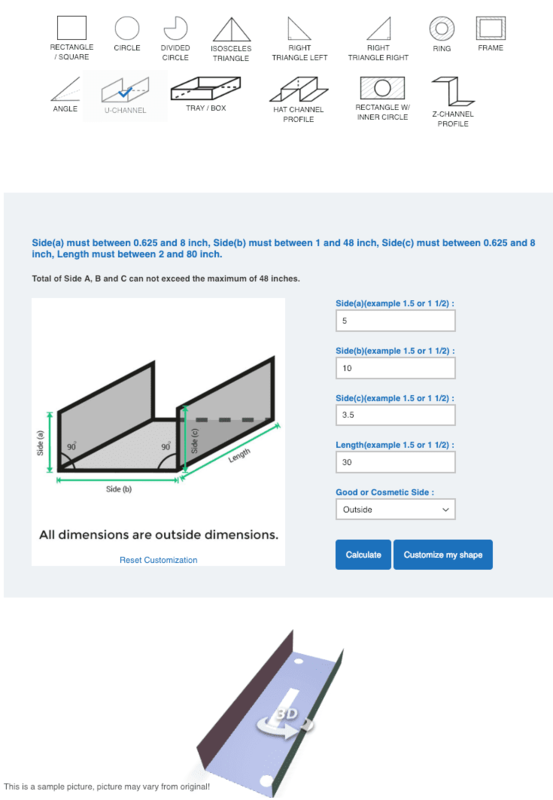 The sheet metal calculator will give you a price for your custom cut metal u channel including the options you have chosen. Choose the desired type of metal from our available options. Then enter the sizes for each side that describes a U channel. You can even configure a J Channel and we will tailor make the U channel exactly the way you require. A U channel is generally shaped as the letter “U”. You will have to define the 3 measurements the 2 sides and the base. All measurements can be determined by you. You can also configure a so called J channel, where one of the legs is shorter then the other. A U Channel is often used to frame a thin panel as a decorative finishing part or as a channel to hold cables. At MetalsCut4U, we fabricate exactly the way you need your U channel or J channel to be. We fabricate to order and there are no minimum quantities.